How would you know you liked driving a classic or vintage car unless you actually tried it? How would you know you enjoyed fettling a vintage or classic car unless you actually lived with and enjoyed one for a period of time? Well now there is an answer – The Classic Car Loan Project. I got to know classic cars through poverty and cheap skating on cars in a way I call bangernomics when I was young and potless. 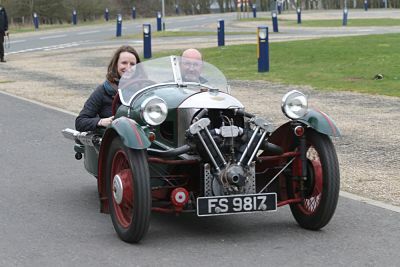 And as a young kid I used to go to VSCC meetings with my Dad (where my brother got run over by a Lagonda in the ‘70s) I also grew up with my Dads dismantled Lagonda in the garage. But I started my fettling with the VW Beetle which was my first car, and carried on through a series of cars that had mechanical parts such as distributers and carburettors. A whole different ball game the black magic and voodoo underneath the bonnet of a modern car. So how would you learn about the workings of a car when it is so far beyond our comprehension; this is where the Classic Car Loan Project scheme comes into play. Bob contacted me about this venture and asked me to help get some decent tyres onto a Model A Ford they were lending to a Young man, and Longstone Classic Tyres have been involved ever since.